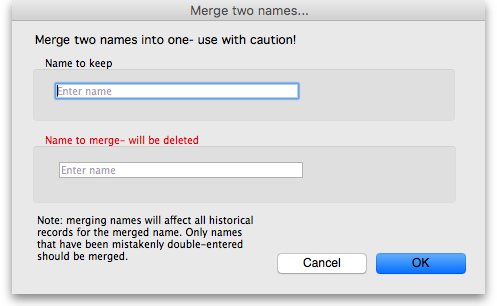 If you accidentally enter two names into mSupply that identify the same organisation, you can use this command to combine them. Use extreme caution: This operation will move all historical records from the name you delete to the name you are keeping. The operation can only be undone by reverting to a backup copy of your data file. In the window displayed enter the name to keep, and then the name to delete. When you have checked then checked again that the information is correct, click the OK button. You will be given one last chance, and then…..
You can also merge a name into a virtual store (the store must be the name to keep). This is particularly useful if, for example, you have a customer which you now want to turn into a store to manage their stock more fully. This has the benefit of moving all the transactions connected with the customer into the store so that you don't lose any historical transaction information. When you merge a (customer) name with a virtual store you must finalise all transactions belonging to the customer first (mSupply will tell you to do this if you have not already).